Ketchum toddler Ruby Crist, the 3-year-old daughter of former U.S. Ski Team racer Zach Crist, zoomed down the course during the 53rd running of the Kindercup ski race Saturday at Dollar Mountain in Sun Valley. Crist, one of 286 race participants, missed a gate, so she stayed off the podium. 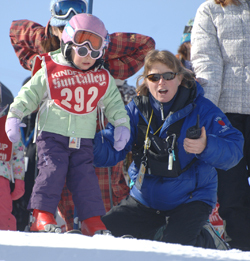 Longtime volunteer Doran Key, right, once again assisted the younger kids leaving the starting gate. Can 'biomimicry' help save the Earth?